England's emerging talent Will Muir chats to TRU ahead of the Rugby World Cup Sevens in San Francisco this weekend. This is a story of a young man who was playing university rugby just four months ago, but is now preparing to represent his country on the biggest stage of all. Having achieved a degree in Mechanical Engineering at Northumbria, Will Muir has powered his way into England’s squad for the upcoming Rugby World Cup Sevens in San Francisco. Considering he was still enjoying all the perks of university life back in April, it isn’t surprising to hear Muir describe his call-up as a “shock” but in reality, his talent and ability suggests the selection of the youngster is more than justified. The last couple of weeks could be argued as the beginning of Muir’s journey. A victory with England at Exeter was swiftly followed by his graduation from university before being named in a World Cup squad. It’s non-stop for @Willmuir5 at the minute! A prodigy of the @tnrugbyunion, @Dazzfearn & the @BUCSsuperrugby programmes! Super proud to have Will, an @NUstudents alumni flying out to represent @EnglandRugby in the 7’s World Cup! "I was completely ecstatic when I got the phone call,” says Muir. “I got my head down and started preparing for the tournament as soon as I could, but I was over the moon. After excelling in an impressive Northumbria side last season, Muir knew that Sevens was the path that he would go down once his three years in Newcastle came to a conclusion, but a World Cup place was never at the forefront of his mind. “I was shocked to get the call-up and it has been quite a quick turnaround,” he added. “I sort of knew in advance that Sevens would be my next step so I got my head down with training as soon as I finished my exams to try and give myself a head start. Muir tasted the Sevens environment last year with trips to South Africa as well as the Silicon Valley 7s in November, but his recent involvement with the senior side in Marcoussis and Exeter has paved the way for a trip to the Golden City. He refers to the “support and guidance” he has received from many different people as one factor in why he pursued a career in Sevens, but ultimately, his experience at university gave him the platform to take his next step up the rugby ladder. On the field @BUCSsuperrugby top try scorer & Contracted with England 7s for next season, off the field achieving a 1st class mechanical engineering degree. 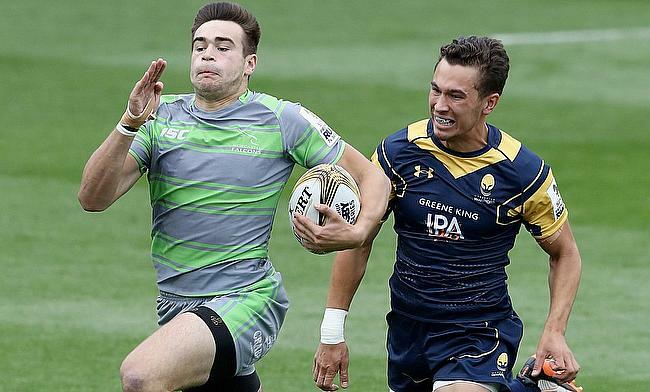 Muir is one of the latest players to make the transition from university rugby into the professional game with teammate Will Edwards coming from Loughborough into the England set-up whilst fellow Northumbria graduate Jake Ellwood recently penned a deal with Championship club Ealing Trailfinders. Northumbria shone in university rugby’s top tier (BUCS Super Rugby) last season and Muir was an integral part of their success. Named as Top Try Scorer in the division and selected in the BUCS Team of the Year, he was ruthless off the wing and his scoring ability allowed Darren Fearn’s side to finish in the top four of the division. Unfortunately, it wasn’t to be a fairy tale ending for Muir as Northumbria fell at the semi-finals stage of the competition, but he admits the platform university rugby offers is crucial for development. “I owe quite a lot to Northumbria,” Muir says. “They let me come away from my studies for the week when I went to South Africa and America too. They showed a lot of support for me academically as well as with the rugby. It all fell into place nicely and credit to them for letting me get on with it. “Darren has really put things in a good place. They [Northumbira] are really looking to push on next year. It was a shame towards the end of the season as we sort of let it slip through our fingers and we didn’t win the whole league, but Daz has really got things looking professional. “Playing university rugby is huge. It is a massive shop window to put yourself in. It is a massive stepping stone for players who are looking to push on into the professional game and play for a living. The pathway of university rugby has led Muir to a World Cup with an England side that is continuing to progress at just the right time. They ended the HSBC 7s series with a silver medal in Paris and more recently, finished third in Marcoussis before claiming a Cup win in Exeter at the beginning of July. Momentum is building amongst Simon Amor’s ranks and Muir admits it could be key if England are to challenge the likes of South Africa, Fiji and New Zealand at AT&T Park this coming weekend. “It [victory in Exeter] was pretty important. I think we did a lot of different scenarios that Simon set-up and we adpated well. To get that win at Exeter in front of the home crowd was just a bonus. “How we have sort of finished the season has been great because we have really found some form. On his own ambitions, Muir continued: “It is just one step at a time. I really want to concentrate on the World Cup which is just around the corner, get my head down and give it my best shot to see where I am after that. England begin their tournament at 04:09 (BST) on Saturday morning against either Samoa or Uganda.